This Valentine’s Day, show some love for the needy! Help Stanbridge College REACH raise funds to purchase bus passes for homeless people in Orange County. Join us at the Valentine’s Day Ice Cream and Popcorn Social in the Stanbridge College Student Lounge. Enjoy a tasty treat, hang out with your sweetheart and show your love for your community. Each ice cream and popcorn treat will be on sale for $1.00 a piece. At this event, we will also be unveiling the new Stanbridge College pennant, on sale for $5.00 per pennant. All proceeds from ice cream, popcorn and pennant sales will go to purchasing bus passes for the homeless. With a bus pass, people without a home are able to travel to shelters, soup kitchens and other organizations. They can access food, shelter and other donations. For some, a bus pass is a ticket to survival. Your community needs more than candy and flowers this Valentine’s Day. 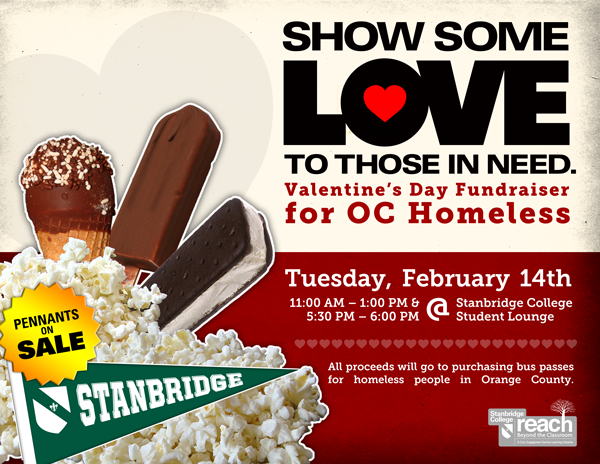 Show Orange County your love by supporting those in need.